Now I know it’s still the holidays for many teachers but it’s a good time to think ahead so my posts for the rest of the UK summer holidays will have a new school year theme. This week – learning names. Something we all need to do at the start of each year, I’m determined to learn the names of my classes faster this year! I was interested to see a suggestion to seat your class alphabetically by their first name rather than surname on Classrooms and Staffrooms; that could be worth a try. I have used name cards before and I am wondering whether to try these again. These are simple to make from an A4 piece of paper which can be folded in half and then folded in half again. Students can then write their name clearly on one side of the card. The other side of the card visible to the student could be a reminder of anything you want; the above illustration shows the card I used for a lesson observation with a class I was unfamiliar with. For the new school year I am tempted to write some reminders for them! For example, always remember your calculator, homework will be set on…and the address of the blog I use to post details of homework. In case it’s useful this is the Word file for the above example; I will probably try and improve this and make it a bit prettier! Learning Students’ Names from the University of Nebraska includes many suggestions. 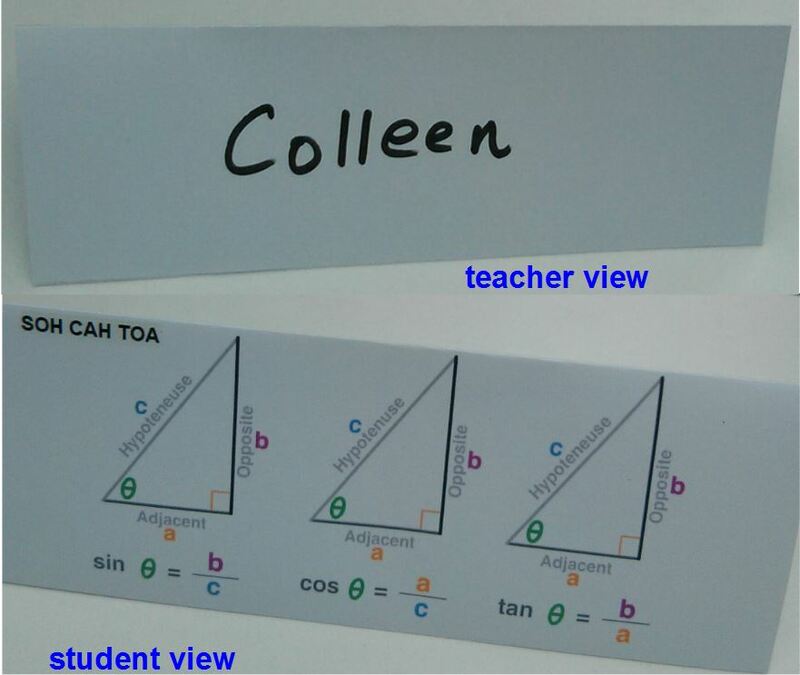 I might try a variation on suggestion 15 here with younger students, perhaps they could try and think of a mathematical term which begins with the same initial letter as their name, Colleen calculator, Tina triangle….! 10 Techniques for learning Names from Cuesta College. Certainly I think this is worth spending time on and should be a priority, we want our students to know that we know who they are! All good stuff, and thanks for the reminder that we need to be getting ready soon on this mammoth task of September, and for the links. I always think I’m going to make mug shots with their names written on a mini-whiteboard, and never get round to it. Now I know others use photos I won’t be so bashful.